I think it’s safe to say that CoYo Coconut Milk Yogurt is like no other on the market. The taste is pure, the texture is intensely creamy, and as you will quickly discover, the label is a bit of a shocker. Though I’m an avid label reader, I usually stick to the ingredients and the sugar count. 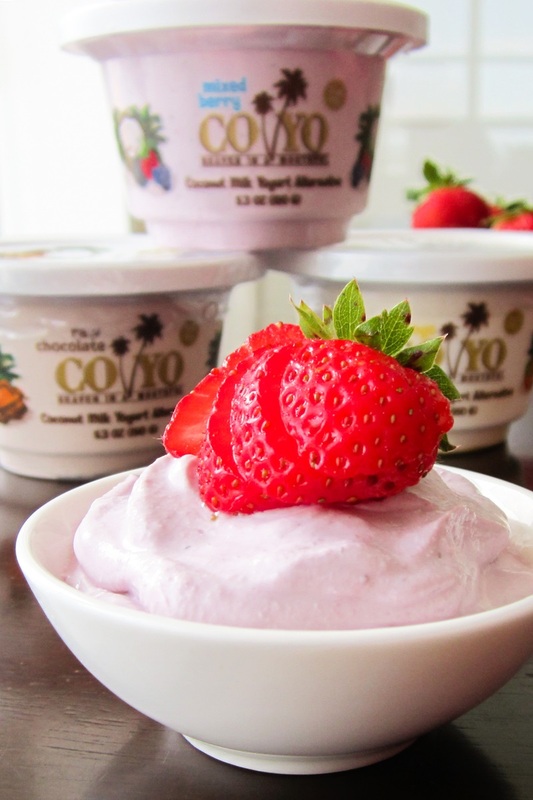 CoYo uses simple all-natural ingredients and no added sweeteners, so they got an immediate two thumbs up. But it was hard to miss the super-high fat content and calorie count. Each “serving” has about 38 grams of fat and 360 to 390 calories. I mention it upfront as most of us aren’t used to such rich everyday foods, but I think it’s time to make an exception with CoYo. Plus, CoYo Coconut Milk Yogurt is a little too luxurious for me to down in one sitting. One “single-serve” 5.3-ounce cup lasted me two to three days, and I easily stretched the “2-serving” 12-ounce tub to 4 servings. It was not only good by the small spoonful, but it was also great with fresh fruit or cereal, parfait style, or as a topping. The fulfilling servings and versatility made the slightly steep price much easier to justify, especially when it was on sale. And if you don’t believe me on the richness, just look at the photo below. That spoon stayed standing without any coaxing! Why is CoYo so decadent? They use straight up, awesome, rich, raw, coconut cream as the base. A mouthful may be a little much (as noted on their packaging), but it is still dreamy in small spoonfuls. 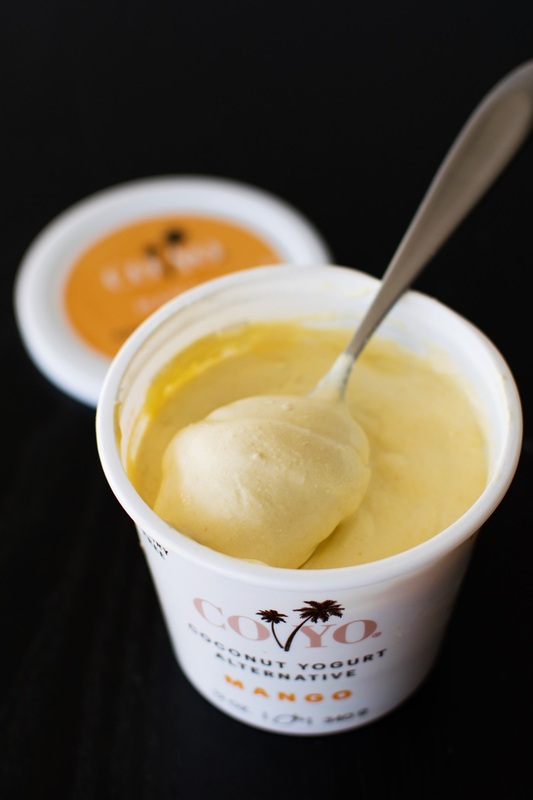 Thus far, we’ve sampled all flavors of CoYo, with the exception of the Vanilla Bean. I’m updating this whole post, because I just purchased the Mango flavor and took some new photos. I spotted the multi-serve on for a steal, and couldn’t resist. They have tweaked the formula only slightly since my first review, so my notes are still very similar. The fruit puree was all on the bottom, but after a good stir, it turned a beautiful peachy color. And despite the lack of any added sweeteners, I though this flavor was spot on delicious. It was just sweet enough with a nice yogurt finish, and the rich, creamy decadence of each bite was hard to beat. As you can see below, it is very thick, almost like a heavy whipped cream. I loved this variety! There was virtually no sweetness. This wonderfully earthy, perfectly soured (a little tart, but more sour) flavor was like a healthy, creamy, blank canvas. 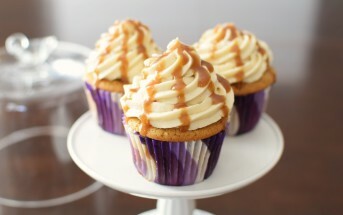 It is easily sweetened to perfection with just a few drops of vanilla stevia, and even tasted a smidgen like cheesecake. 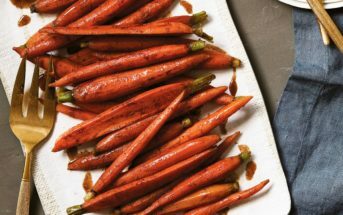 Or it can be left plain to compliment ripe fresh fruit, for flavor and thickening in salad dressing or sauces, or as as a stand-in topper when something such as sour cream or an unsweetened heavy whipped cream is needed. I haven’t found this flavor yet. Don’t forget to leave your own rating and review below, especially if you’ve tried this flavor! I’ve never been much of a chocolate yogurt fan. Soured cocoa just isn’t my thing. But, I did enjoy this flavor when lightly sweetened (honey or stevia) and served with fresh berries. Some added dark chocolate was a perfect touch. The raw chocolate CoYo is more creamy and bitter than sweet, but overall pretty mild in taste. 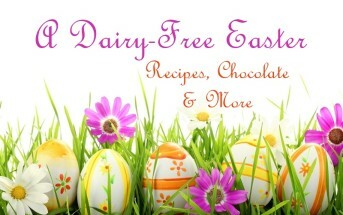 I think with the right cacao loving crowd, this one would be a big hit. If you are used to Yoplait-sweet fruit yogurts, then CoYo’s Mixed Berry may be an initial shock. It has just a touch of mild sweetness from the natural berry goodness. The flavor shines with a drizzle of honey or a few drops of stevia, but once your taste buds adjust, it is very pleasant on its own. Price: $2.99 per 5.3-ounce container and $4.25 per 12-ounce tub. Availability: Coyo Coconut Milk Yogurt is available at natural food stores in the U.S., U.K., New Zealand, and Australia. Certifications: Coyo Coconut Milk Yogurt appears to be Certified Paleo an Certified Kosher Natural. 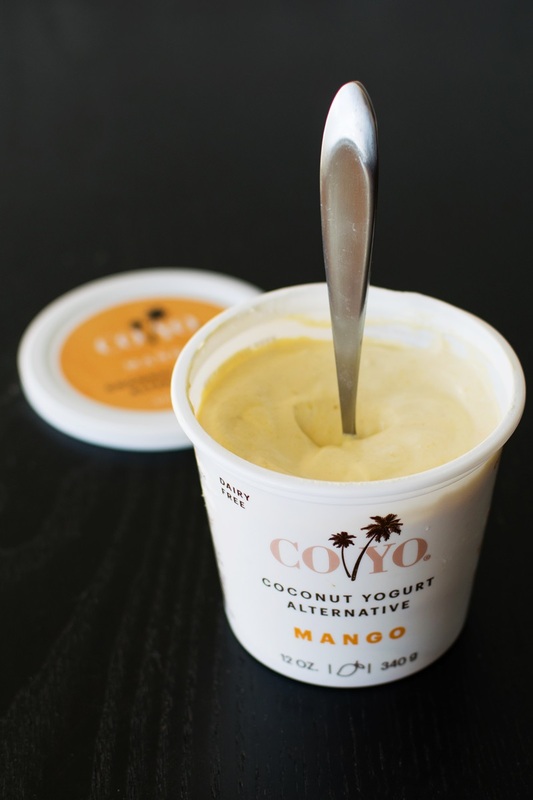 Dietary Notes: By ingredients, Coyo Coconut Milk Yogurt is dairy-free / non-dairy, egg-free, gluten-free, grain-free, nut-free, peanut-free, soy-free, sugar-free, paleo, vegan, and vegetarian. Nonetheless, check with the company on their manufacturing processes for all varieties if potential allergen cross-contamination is an issue for you. Processes and labeling are subject to change at any time for any company / product. For More Product Information: Visit the CoYo website at coyo.com. Excellent flavor and texture. Not runny like most non dairy yoghurts. Omg! This yogurt is heaven in a spoon. Is rich,flavorful and delicious..
Best substitute for the Greek yogurt I can no longer have. Anywhere else to find other than Whole Foods in the United States? Best yogurt I’ve ever had . Love how thick it is and the low sugar count . I’ve had the chocolate and vanilla. I’m not really a chocolate person but it was actually pretty good but vanilla is my favorite.Thank you CoYo for a really good dairy free yogurt. It’s so rich, that I prefer it as a topping rather than a yogurt. The berry and mango are just sweet enough on their own. The chocolate needs a little honey and the natural is good when you don’t want anything sweet at all. I like that a little container lasts me for 3 servings! Got away from yogurt years ago because of all the sugar and I don’t like the taste of yogurt, generally. Because this yogurt uses stevia, thought I would give it a try. Not a big fan of yogurt, but I know it has healthy benefits…. “Health benefits can include promoting bone health and aiding digestion. Some yogurts contain active, living bacteria known as probiotics, which can help keep the intestines.” So once I got past the tart, the chocolate and the mango are really good that I’ve tried so far. I throw in a few stevia choco chips and unsweetened coconut for a little extra something. They have a new customer. I bought a pot of the coconut yoghurt, opened it well within the use by date and found it was just solid from top to bottom. I went online to see if this was how it should be and it seemed not. So I looked at Co Yo’s website to see if I could ring customer services and ask if it was ok to eat or what I should do. To my surprise, there is no number, you can only email – not so good for a fresh food manufacturer I think. Anyway, emailed them and got a reply 30 hours later saying all about how they had changed their tapioca starch supplier how they are testing to how much to put in and how I could should help them with their research. My question was ignored! I emailed back to say I did not want to be part of their testing, I just wanted to know if my product was safe to eat and what my options were. I was amazed to get a reply with 2 paragraphs telling me off for not wanting to be part of their testing and 2 lines saying I could take it back to the store or they could send me a voucher if I wanted! What appalling customer service and this at £5 for a pot of yoghurt! No concern for my health nor that their product was faulty. 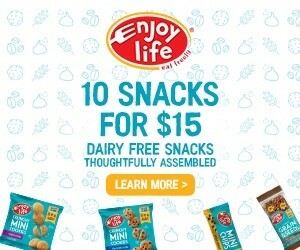 There has been a recent recall of their products and together with this experience, I would have NO confidence in the health or quality of their products. Hi Jamie, I’m not affiliated with the company at all (this is an unbiased review), so I can’t speak to your experience with them. But the yogurt is very, very thick. Like thick coconut cream. It’s stand a spoon in it thick. pasteurized? Can I take while pregnant? I had one and I’m worried! Hi Kel, I’m not affiliated with the company and I’m not a physician. I can’t advise you on whether a product is safe for you. You should reach out to them and to your doctor if concerned. 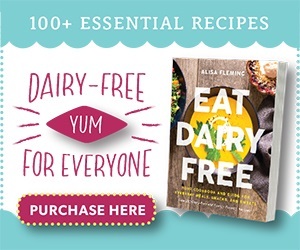 I’ve never heard of any problems with plant-based yogurt and pregnancy, but I can’t speculate! Great product. On my last trip to australia I liked it. That’s awesome. Thanks for sharing your feedback Dena! I just tried the chocolate co yo! Loved it! This is the only coconut yogurt I’ve found without added sugars! Amazing! I’ll be reccomending it on my site! I get a large tub of CoYo every week and spread it out over 2/3 days. I tend to have it with blueberries or chopped dates and a couple of teaspoonfuls of raw honey mixed through it. Me gusta! For me the high fat content is actually a positive as I try to eat as few refined carbs and as much healthy fat (including saturated and monosaturated) as possible. I have lost around 16 lbs over the last three months, got off my antidepressant medication (a growing body of evidence shows that low-fat diets correlate strongly with depression and suicide), and generally have a lot more energy. Thanks for sharing your review on these David! Congrats on your health success and I’m with you on not eating low fat. Where can I find this in San Diego California??? 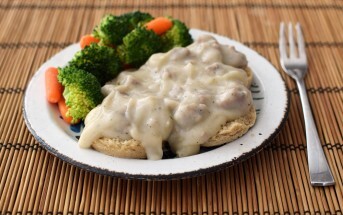 It’s my breakfast every morning… Just wonderful, very filling, amazing flavor! I am on a LC/anti-inflammatory diet, and this is the perfect quick and filling food. I should also say…that I have lost 10 lbs thus far and still losing – while eating this yogurt daily. That’s fantastic Sarah! Thank you for sharing. I just ate the mango and within 30 minutes was violently throwing up. I don’t recommend this product. You should probably contact the company to report this Amber. Just discovered this wonderful yogurt at our local Whole Foods. I had not loved the past coconut yogurts I had tried. It reminded me a little of a Greek yogurt mixed with Yobaby my kids used to eat about 12 years ago. The calorie content bummed me out, which led me to google. I thought my eyes were fooling me! The single servings will become multiple. It is so delicious! The calorie count bummed me out to Linda, but it is definitely amazing! I just picked up the mango one at a Whole Foods in Virginia. It’s amazing! It’s so rich and flavorful. Awesome! So glad you found it – I hope their distribution keeps picking up! What are the ingredients ??? This stuff is so delicious! The mixed berry is soooooooo fine. Where can you buy this in the US? Washington state specifically. Hi Tammy, you can check their website for a store locator or to email them directly about availability in your area.